Features notations depicting the distance lighthouses and other beacons can be seen off the coast. 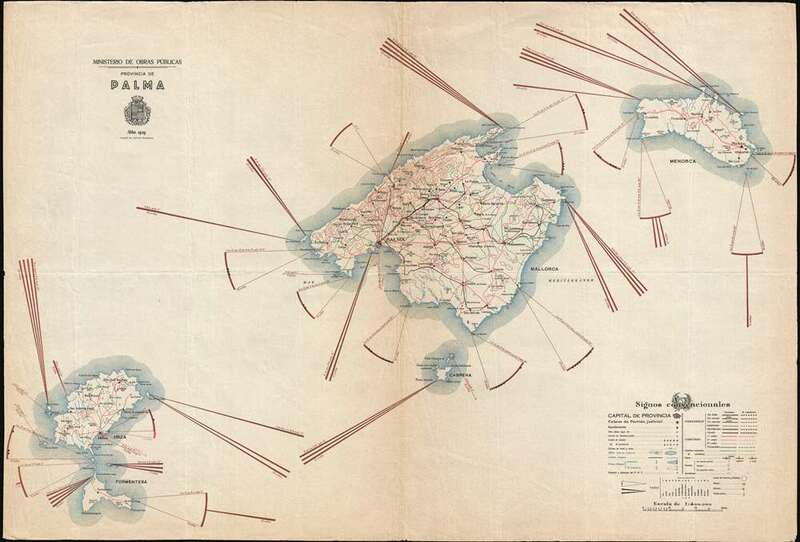 This is a 1935 Instituto Geografico map of the Balearic Islands. The map depicts the archipelago, which is made up of the islands of Majorca, Minorca, and Ibiza, along with the smaller islands Formentera and Cabrera. A beautiful piece, its most compelling feature is the illustration of the lighthouses and beacons installed on the coasts of the islands. The distance out in the Mediterranean each light can be seen is eye-catching, and details, such as the color of each light and frequency of flashes of different colors are also given. Numerous cities, towns, and villages are labeled throughout the islands. Roads and railroads are also illustrated, and different lines are used to denote variations in grade for both. A key is situated in the lower right corner that provides the viewer with an explanation of all the notations used. This map was created by the Talleres del Instituto Geografico and published by the Ministerio de Obras Públicas in 1935. Good. Mounted on linen. Exhibits some loss at fold intersection at center. Wear along margins. Blank on verso.